The first two way are recommended, because they use routines. Do not use History to log your ongoing workout! If GymGoal closes before you hit Save, you will lose it. When you log your workouts correctly, there is no Save button – everything is saved immediately. There are two buttons above the date entry field: On schedule… and Today…. They change the workout date to the date shown on the button. On schedule… appears only when you tap a workout day in the schedule. In this example the Monday workout was tapped, but today is Wednesday. If you missed your Monday workout and you are starting it now, leave the today’s date and tap Start >. If you worked out on Monday without GymGoal, you can change the date to Monday and enter your workout results now. Session # - GymGoal supports up to 4 workout sessions a day. For example there may be a morning session, a midday session, an evening session. Each session is a separate workout, with a start time, duration, and a number of exercises. 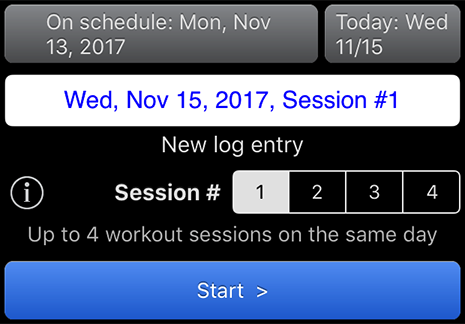 New log entry – When you select a date and a session number, GymGoal shows if there is already a workout record in History for this date and session. If there is no record, it displays New log entry. When there is already a workout record in History for the selected date and session, the info line displays Add to existing log record. This indicates that the existing workout record will not be deleted – the new workout data will be added at the end of the existing data.